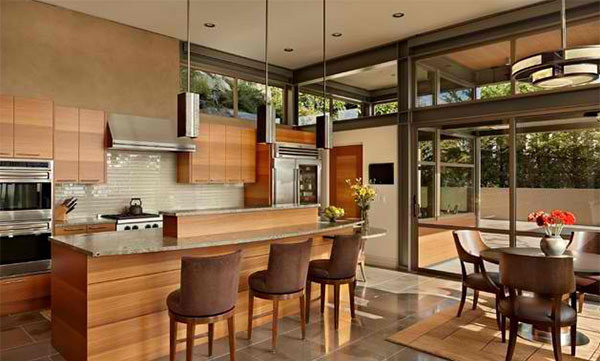 Of course, the kitchen and the dining are near each other because their functions are closely linked. We prepare food in the kitchen and serve it in the dining for consumption. Although some kitchens are eat-in, there is still a dining area. 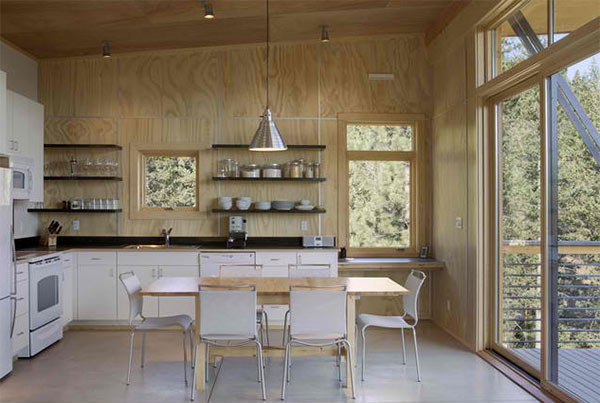 Eat-in kitchens are done when the kitchen is enclosed in a different room or the space is small. But most of the time, a kitchen-dining area is what we will see. 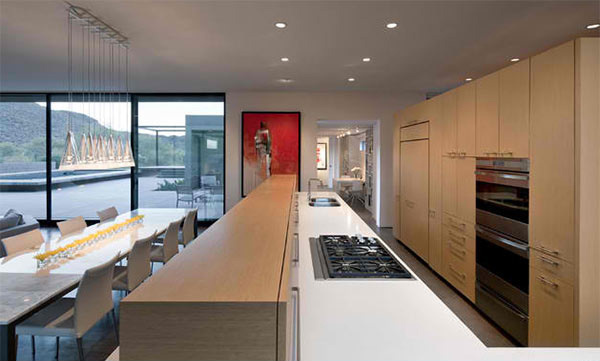 Today, we have gathered some modern interiors showing kitchen-dining spaces. You can see how different kitchen layouts could complement with the dining areas and how both spaces look good together while still remaining separate in function. 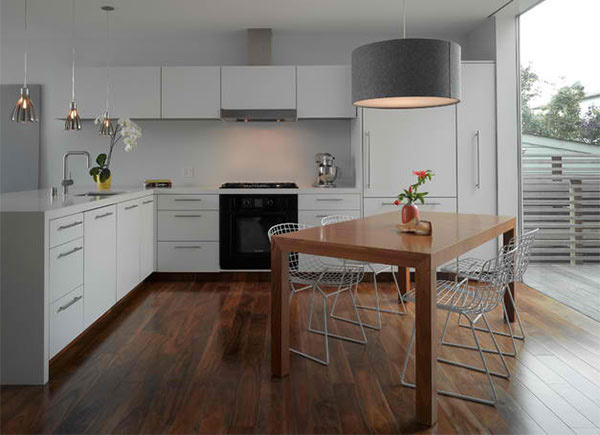 Take a look at the interiors below so that if your home has a similar style, you could get ideas on how to arrange everything for a kitchen-dining space. This area looks really modern not just because of the sleek lines in it but also with its choice of colors. Even the wall decor is minimal in style. 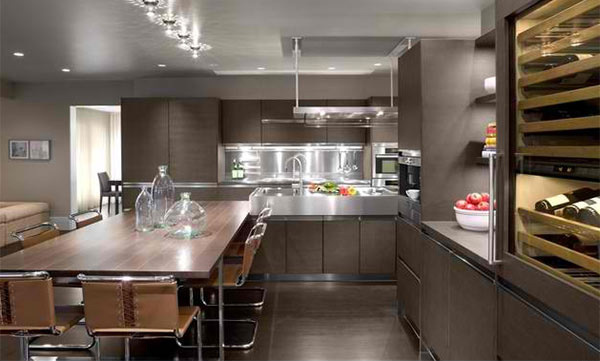 Glass and stainless elements in the area add some sheen in it for a more sophisticated look. This one use wood for the island and cabinets. Even the dining area is wooden too. The lift and slide door leads to the garden of this house. While Eames Molded Plastic Side Chair w/Eiffel Base grace the dining area. You can see that white is used in the area wherein one wall is decorated with an intricate mural. The Big Bang XL Suspension by Foscarini above the dining area brings drama to this modern space. You can see that wood has various stains and finishes which looks good in the interior. 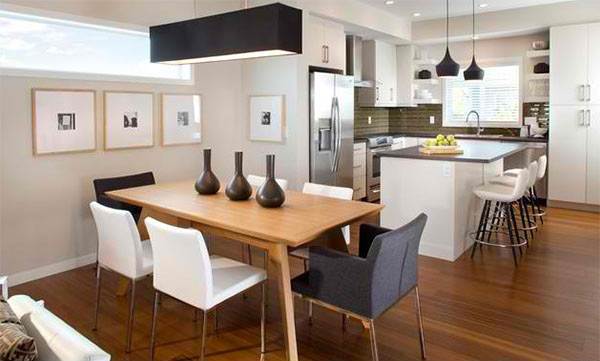 We love the clean look of this kitchen-dining area! The Fly Fly Suspension above the dining area with Heller The Bellini Chairs adds more life to the space. 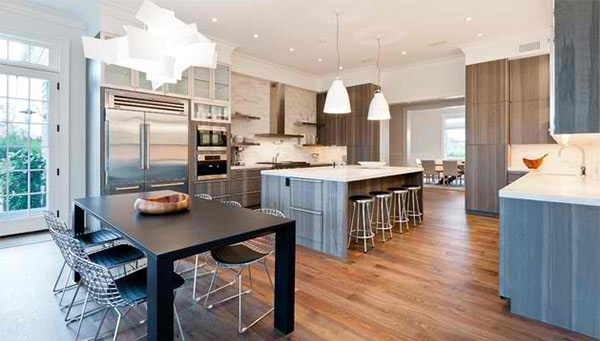 You can see that the dining table as well as the kitchen island and cabinets are parallel to each other. Who will not like the look of this space? It looks cool and neat because of the colors and materials used in it. 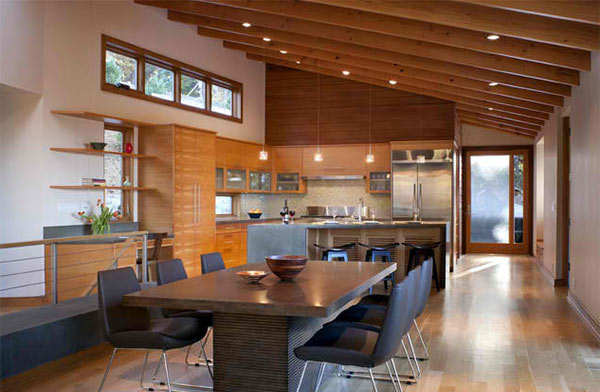 A vaulted ceiling with expose beams give a subtle rustic feel to this modern kitchen-dining area. Used here is a concrete floor with cut control joints and a clear finish on it. It looks pretty good with the wooden walls. 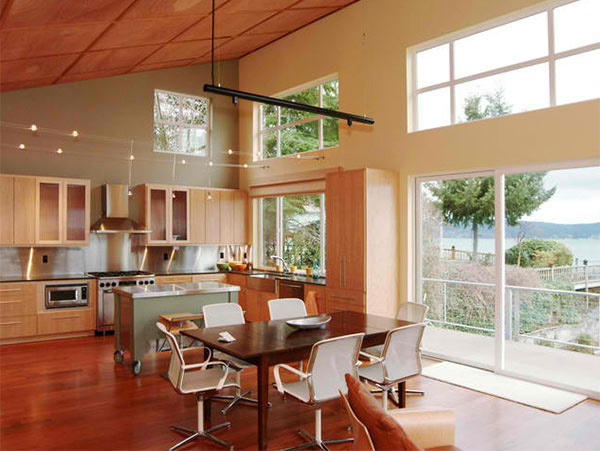 A high ceiling area with an open-layout flooded with natural light from the glass doors and windows. 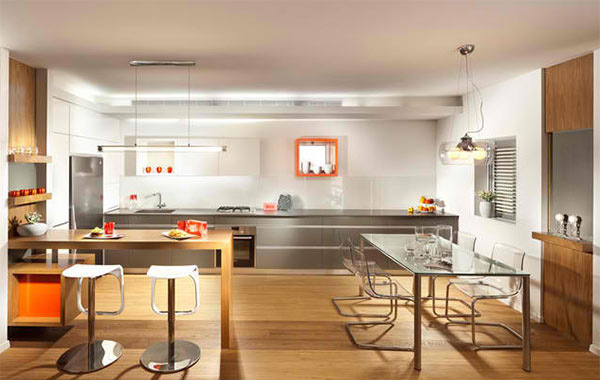 Romeo Louis II Pendant by Flos Lighting add charm to the dining area. You can also see that the kitchen is well lighted too. The flooring’s wood species is “American Black Walnut” which is a pre-finished, engineered floor product from a San Francisco company called Simple Floors. Wood and white combined look really great as usual. 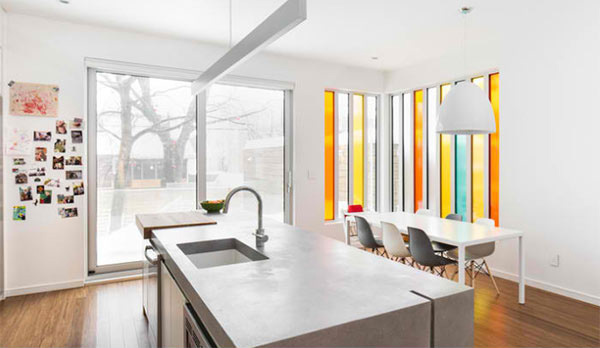 A clean kitchen-dining space that is a lovely glass work on the wall using varying colors of glass. Stunning and very modern! Walnut stain in the kitchen looks lovely which was extended to the chairs of the dining area. 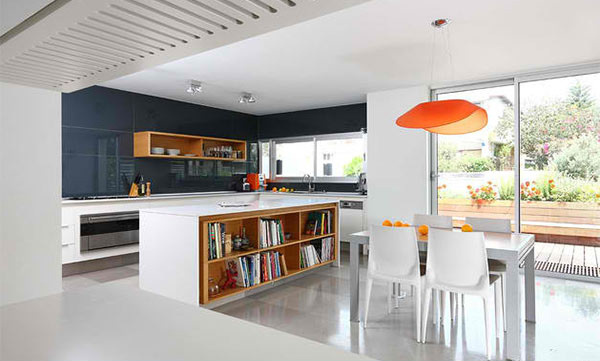 Don’t you love this list of kitchen-dining spaces? Note that each one has a different layout but they all have that sleek modern look. A kitchen as clean and neat as the ones above would definitely make the guests and the family feel safe with the food they are eating in the dining area. Seeing how food is prepared will also assure everyone that food is clean and well-cooked. 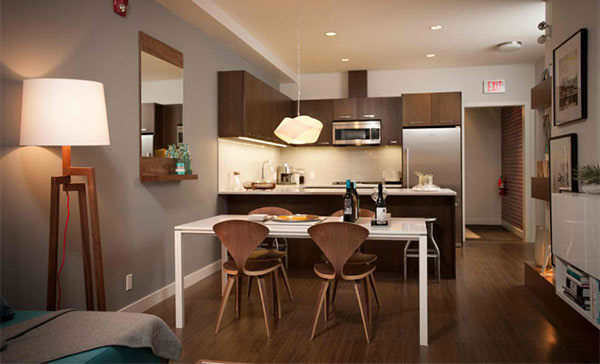 If you don’t’ have enough space for a kitchen-dining area, you can always have an eat-in kitchen.